Apples, honey and racism. Two of them go together. One does not. Need a hint? I’ll give you another set of three words: football (soccer), social media and racism. Two of them go together. One does not. Can you guess which one? The first answer was pretty obvious, but the second answer is football (for purposes of this article, I’m talking about the round ball) -- and yes, the allusion is that social media and racism go together. Let me explain. We’ve just celebrated Jewish New Year, known as Rosh Hashanah. 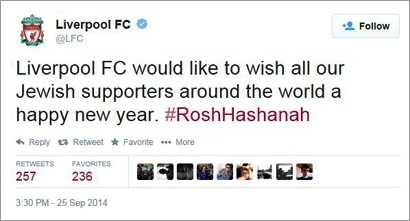 It is customary to greet people with the words “Shana Tova,” which is essentially the same thing as “Happy New Year.” Pretty innocuous -- and in the case of Liverpool Football Club wishing its Jewish fans a happy new year, you wouldn’t think it would garner much of a reaction. More on this specific incident in a moment, but it’s probably worth providing a little more context about racism in football, which has been and still IS a huge problem. To the credit of football clubs and organizing associations, there have been tremendous efforts to unequivocally stamp out racism in football. As an example, before every single game at the World Cup in Brazil this year, there was an anti-racism pledge recited by both teams before every single game. Football clubs are being fined and penalized for their supporters’ actions. For the past 34 years, I’ve supported the Tottenham Hotspur Football Club (known as Spurs, and located in Tottenham, London.) Spurs has long been associated as a Jewish club, so much so that it’s also known as the Yiddos, Yids or Yid Army. The past year has seen authorities attempting to stamp out any mention of the word “Yid” -- to the point where actual supporters were fined or banned for chanting the word in the stands. On one hand, you have both Jewish and non-Jewish fans being prosecuted for an affectionate nickname. Still, what happens when opposing -- ignorant -- fans from arch rivals like West Ham mimic hissing sounds akin to that of the gas chambers during the Holocaust? Which brings us back to the Liverpool Football Club deleting its tweet. In the past, Liverpool tweeted Happy Ramadan to its Muslim fans (replies were akin to “classy as always”), so it is obviously very sad that the same standards and reactions were not applied this time round. To their credit, the London Football Club did issue the obligatory social media faux-pas-mea-culpa-retraction-apology -- but surely, too little too late. Sometimes however, social media does get it right. Earlier this year for example, Barcelona player Dani Alves picked up a banana (Google banana + racism if you need more context) thrown at him, peeled it and took a bite. Afterwards he turned to Twitter and expressed lighthearted gratitude at the extra potassium he received from the banana. In support, other celebrity players like Neymar have posted photos of themselves with a banana. It would appear that when it comes to social media (and in this case, football and racism), individuals “get it” -- but at a more organized and corporate level, there is still confusion, chaos and cluelessness. So at what point will we (as corporations, entities, associations, governments and/or football clubs) figure out a consistent approach to social media -- and in the case of Twitter, take the position of a true conversation, versus “all broadcast all the time”?